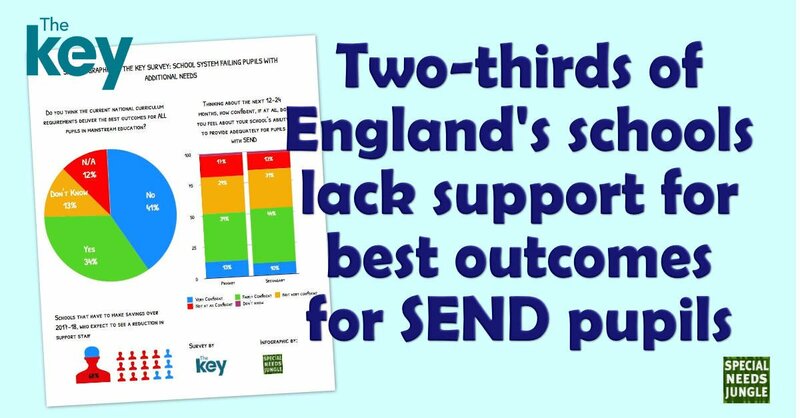 A survey of more than 1,000 school leaders has revealed that more than two-thirds (68%) say they lack the support to deliver the best outcomes for pupils with special educational needs and disabilities (SEND). School heads say the education system is “rigid and discriminatory” and prevents some pupils from reaching their full potential. The survey was carried out by The Key, an organisation that provides leadership and management support to half of England's schools. Eight in 10 (79%) of the 1200 school heads questioned say the current curriculum requirements are not providing the best outcomes for all of their pupils. The survey also showed that over half (56%) say pupils for whom English is an additional language (EAL) are also being failed while two-fifths (43%) of school leaders saying the system is holding back pupils with an aptitude for vocational subjects. One deputy head in the south east said that the new curriculum is too difficult for some pupils with EAL and SEND to make sufficient progress that is measurable while another commented that the 'one size fits all' mentality of the new curriculum and assessment without levels restricted both gifted and talented, and pupils with SEN. The findings come just a few months after a recent government research report revealed that some local authorities do not have any procedures in place to collect and review the outcomes of pupils with SEND. Despite the £1.3 billion announced by Education Secretary, Justine Greening last July, almost half of primary leaders (46%) and two in five (44%) secondary leaders, say that over the next two years, they are not confident in their school’s ability to sufficiently provide for pupils with SEND. More than two-thirds (68%) of the 64% of school leaders who need to make savings in 2017-18 plan to reduce their Teaching Assistants, who often deliver the only additional input children on SEN Support receive. “The system needs a greater amount of flexibility as it is very rigid, archaic and discriminatory.” Midlands SENCo. The school leaders say more funding and additional specialist teaching assistants would help solve the crisis they're facing. Additionally, a greater flexibility in the curriculum and assessments. Some schools have trained other pupils as language interpreters for some children who are learning to speak English, while others celebrate pupils’ different cultural backgrounds with activities or whole-school assemblies dedicated to a different language per month. The Key invited a sample of its members to complete its annual survey in February 2017. The questionnaire for this study was designed by The Key and conducted online using Survey Monkey. 1,182 school leaders from mainstream primary and secondary schools completed the full survey. The data has been weighted to match the population profile of schools in England in terms of region, school phase and school type. The profile of The Key’s membership database is similar to the profile of schools across England. The data can therefore be taken to represent the views of school leaders on The Key’s database, which in turn provides an indication of the opinions of leaders in mainstream schools across England. The survey was designed, administered and analysed by The Key. Ipsos MORI provided advice on questionnaire design and weighting. My 10 year old grandson who is high functioning with ASD/ADHD with sensory issues in all areas, has been completely excluded from primary school, after two years of no individual learning plan, or any support, the school in question has found a reason to expel him. For the last two years, they have been using very heavy handed restraint with him, when I say heavy I mean, 4 male teachers pinning him to the floor, on every occasion he has a meltdown in fact the last time he had red bruises and marks all over his body, I have the photograph from that incident, on another occasion a member of staff, filmed him on a personal phone with the video function, my grandchild ( who doesn’t even like having his picture taken ) begged the man in question to stop, but the man (who is not even a qualified teacher) got all fours and moved towards my grandchild in a ape like way baring his teeth at the child (grandchilds’ description) and and proceeded to say “do not tell me what to do in my school”, the school have tried to fob off the parents by saying they were trying to film him for EHCP, This school is an art based school that have a number of photographic and video cameras why did he use his own personal phone? to make a recording,I believe it is obvious it was for his own pleasure the school has since tried to block his parents right to make a face to face complaint to the board of governors, to whom they have made a formal written complaint, they also reported incident to the police, who said it was outside their jurisdiction? my son and his wife are pursuing the complaint as is their right, they are also seeking legal advice to sue the school as they have completely abused my grandchilds rights, his human rights his rights as a disabled/sen child, and under the data protection law, a video should not have made in this way. My son/daughter -in-law, are determined to show their son this is not the way things should happen in a lawful society. The treatment my grandchild has received from an educational facility leaves me cold and heartbroken. I am sorry this is so long thank you for reading. for the last 2 years my grandchild has been kept in isolation and has been teaching himsely, and thats only because he is so very bright! Sorry to hear about your grandchild’s awful experience. I hope his parents manage to get suitable redress soon. Physical and emotional abuse are not outside the police’s jurisdiction! Report the issue to the independent police complaints body IPCC. It’s also a Data Protection Act and Human Rights issue filming him that way. Disgusting. What’s the point of them then. No wonder so many schools don’t provide the so-called provision.